Key allies of British Prime Minister Theresa May are pushing for a second Brexit referendum. Reports on Sunday said defacto deputy prime minister David Lidington and chief of staff Gavin Barwell are secretly advocating for a second vote. Barwell apparently thinks it’s the only way May can end her Brexit nightmare. Key allies of British Prime Minister Theresa May are quietly circling the waggons for a second Brexit referendum, according to a number of reports. The Sunday Times and Mail on Sunday said defacto deputy prime minister David Lidington and Gavin Barwell, chief of staff at 10 Downing Street, think that a so-called people’s vote will be the only way to end May’s Brexit nightmare. Lidington reportedly spoke to Labour MPs last week in the hope of building cross-party consensus around the idea of a second referendum. Although Labour does not officially support a second vote, a number of prominent MPs are in favour of the idea, including Chuka Umunna and Ben Bradshaw, who were among those Lidington held talks with. Meanwhile, May’s chief of staff Barwell is said to be planning for a people’s vote. He has told a senior a group of Conservative ministers, including Chancellor Philip Hammond and Work and Pensions Secretary Amber Rudd, that a second vote is “the only way out of this,” the Mail on Sunday said. 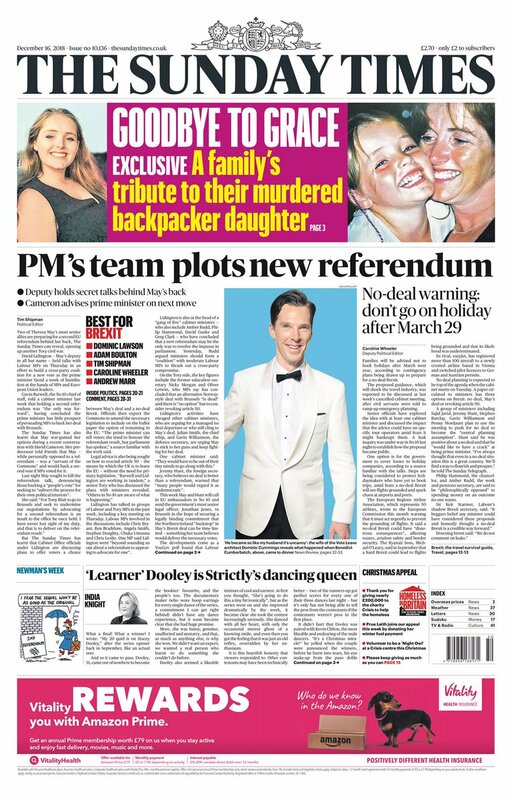 BuzzFeed News was first to report that Lidington and Barwell are courting the idea of another referendum, in what represents a dramatic shift in tone among May’s key allies. It comes after a bruising EU summit this week, during which May failed to get significant concessions on her Brexit deal from European leaders. It means her chances of pushing the withdrawal agreement through British Parliament in a meaningful vote continue to look bleak. May, however, issued a forceful statement on Saturday night, in which she made clear that she is sticking to her plan – which does not involve another vote on leaving the European Union.